Autumn Wallace : How could I say no to you? Autumn Wallace uses her artwork as a means to address social change. Illustrating individuals as large, curvy beings with slightly distorted features, she aims to encourage viewers to see beauty within the ‘imperfect’. Most recently, Ms. Wallace received a Creative Arts, Research and Scholarship Grant to study at the National Museum of African Art and National Museum of African American History and Culture in Washington, D.C. Titled “The Origins of Respect[ability],” her research paper focused on themes of queerness and femininity, specifically within the Black community. We invite you join us for Autumns reception on April 5th. Would a No by any other name smell as sweet? Shut-out, Shut-In, or Shut-Up? That big, hard wall sprung by dismissal creates so many wonderful possibilities! Where, oh where will that sharp left turn bring you? 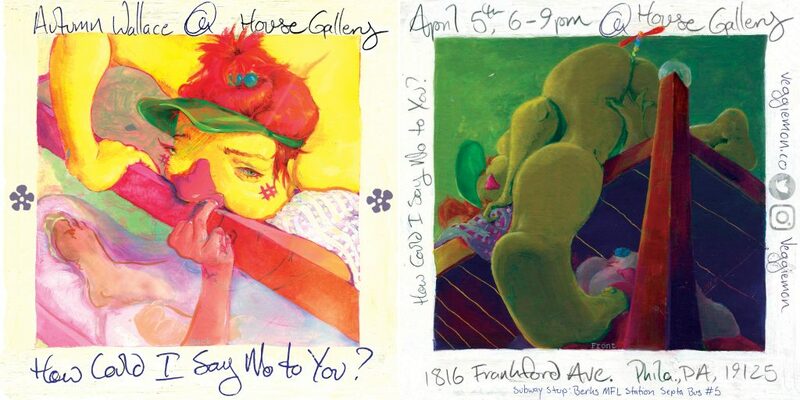 Before you Google what tools you need to split a second for that decision, be aware that in April at HOUSEGallery, Autumn will use experimental thought exercises assisted by paint and clay to lead a guided exploration of the prospects at How Could I Say ‘No’ to You? Come discover your ways here. To Autumn Wallace, Faux-Pas is a destination island where anything is possible. On this island [floated in a small undisclosed Philadelphia enclave], Autumn blends daily life with their borderline obsessions. Prominent features of the island’s attractions include 90’s cartoons, Baroque aesthetics, and ‘Adult Materials’ arranged in painting and sculptures, stirring up narratives of chaotic [con]fusion. Why? Eluding reason boosts emotional response, makes viewers voyeurs, or participants–no bystanders. Here, absurdity is the moderator and we’re all in for the ride. Thank you to Michelle Marcuse for the content of this post. This entry was posted in Art, Art Galleries, Art in Philadelphia, Assemblage, Collage, Comics, Drawings, Fine Art Philadelphia, First Friday, Installation, Mixed Media Art, One-Person Art Show, PA Art, Paintings, Paintings Philadelphia, Philadelphia, Philadelphia Art, Philadelphia Art Galleries, Philadelphia Art Installations, Philadelphia Art Shows, Philadelphia Artists, Philadelphia Artists, Social Practice, Uncategorized, Works on Paper and tagged 90's cartoons, Adult Materials, Art in Philly, Autumn Wallace, Baroque aesthetics, chaotic [con]fusion, DoNArTNeWs Philadelphia Art News Blog, Faux-Pas, feminine, HOUSEGallery, Philadelphia, Philadelphia Art, Philadelphia Artists, queer art, queerness on March 30, 2019 by admin1.